Fighting between Palestinian terrorists in Gaza and Israeli troops all but guarantees civilian casualties. With the fighting comes heart-wrenching photos of the dead and wounded, along with their grieving loved ones. Each death represents a human tragedy. But sometimes, reality is not enough. 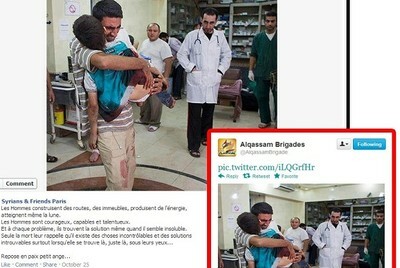 Some Palestinians have been caught faking images or appropriating them from other conflicts. This form of propaganda has been dubbed "Pallywood," and the nascent conflict already has several examples. Tablet Magazine's Adam Chandler exposed one, a terrible image of a grieving father holding his dead child as mournful doctors look on helplessly. Hamas's military wing, the Al-Qassam Brigade, sent the picture out on Twitter. It's a dead child all right, but it took place in Syria, not Gaza, and had nothing to do with this week's violence. It's powerful to see the wounded being rushed into ambulances, and in the crucial battle for public sympathy, some Palestinians put on a show for international news cameras, as the web site Honest Reporting shows in this video. 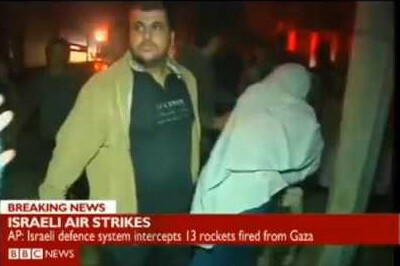 The video shows a Palestinian in a beige jacket being hustled away due to an apparent injury following an Israeli airstrike. Moments later, it appears the same Palestinian has miraculously recovered. These two cases exemplify Hamas' attempts to exaggerate the number of Palestinian casualties throughout the recent escalation of violence with Israel. But this strategy is nothing new. When Israeli troops entered the West Bank city of Jenin in 2002 to root out terrorists there, reports of a "massacre" surfaced immediately and were accepted by western media. More than 1,000 people were reported killed. In the end, the death toll was revised to 56. The ruse went so deep that Palestinians were caught faking funerals with corpses who weren't dead yet. During Israel's 2008-09 incursion into Gaza, reports claimed that a United Nations school building in Jabaliya was bombed, killing more than 40 people. In the social media and communications age, the public relations war is a vital component of Israel's struggle to win the hearts and minds of the international community. Israel Defense Forces are using Twitter and live updates to present its side of the equations. It also is vital to continue exposing Palestinian deception. It can all be summed up and characterized as the fraudcasting industry.